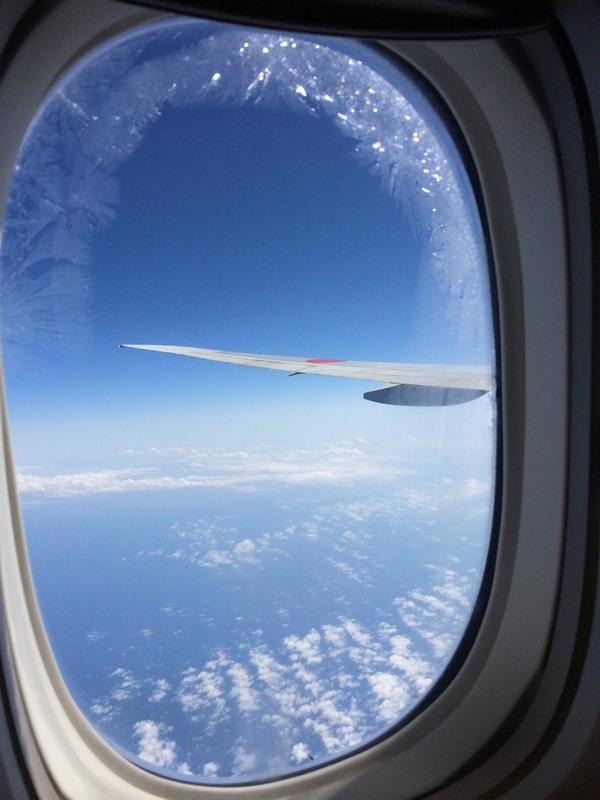 Some quick photos (and a mini review of sorts) from our recent flight on ANA’s fantastic economy class from SFO to NRT. Interesting seats that don’t recline but do slide out. Great service and food. Being primarily a United flyer due to their dominance of SFO it was a very refreshing change to take ANA since their in-flight service is so polished and product is much newer and nicer than most United planes. It is very nice not to have to deal with a airline whose CEO only knows how to cut costs and screw over customers (ala Jeff Smisek). Western Meal – Hamburger patty with cheese. 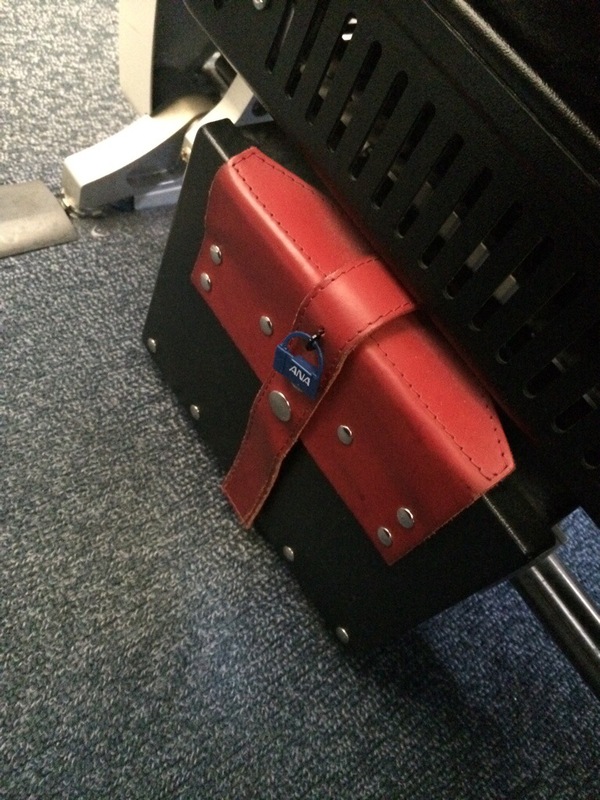 Nice touch on the entertainment boxes – looks like nice French luggage. 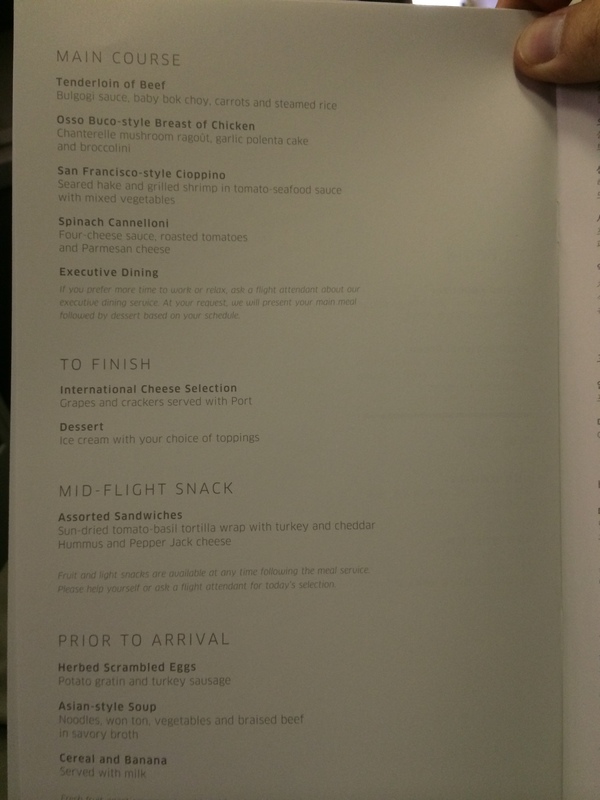 United’s BusinessFIrst Menu. Classy design. Was the food as good? How about the service? Read on to find out! Mimosa served in a plastic cup with the classic United paper napkin. 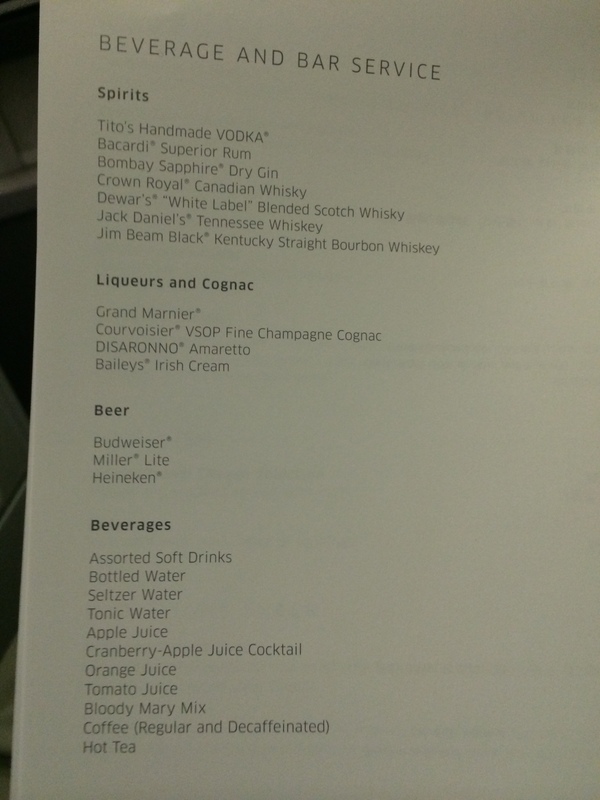 They also had a selection of water, orange juice, or champagne. Mixture of the mimosa was good and flight attendant offered to refill before take off (which I refused wanting to save room for later). Note: coat hooks next to the IFE, does anyone actually use those? Appetizers – To Begin. 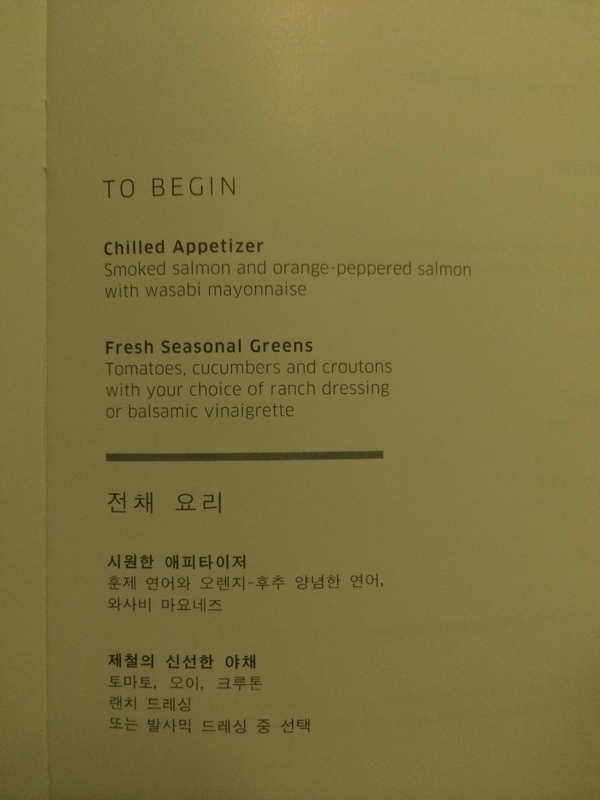 Since the flight was to Korea it was also in Korean. No selection required here, you get both! Main Course – I selected the San Francisco-Style Cioppino. FA was upfront that they may run out of that selection since it was very popular, but when asked if she could recommend a second choice she sighed (typical United) and said that they were all good but that she had not tried any for herself. The FA was older and clearly not in any mood to go above and beyond what is minimally required in her service contract. 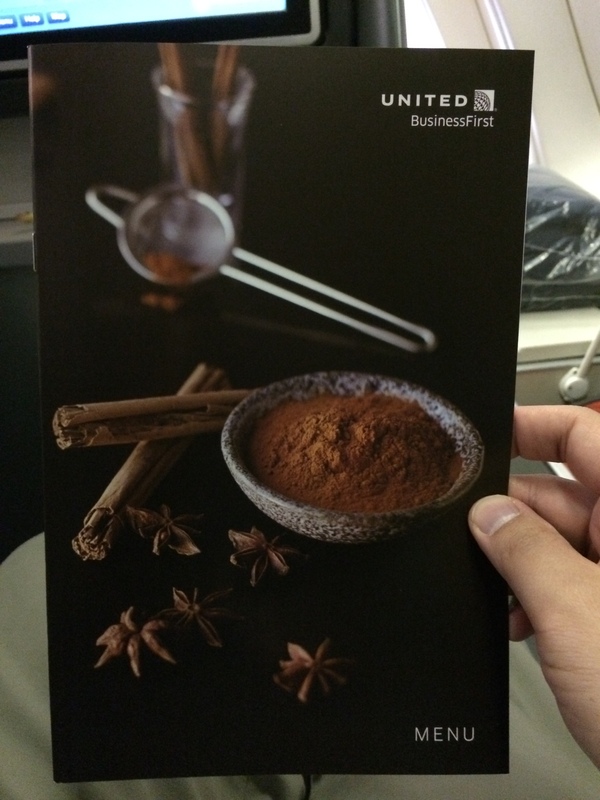 This is the biggest downside of United, they have a good hard product for business class but their soft product (people and service) and that of a budget legacy airline. 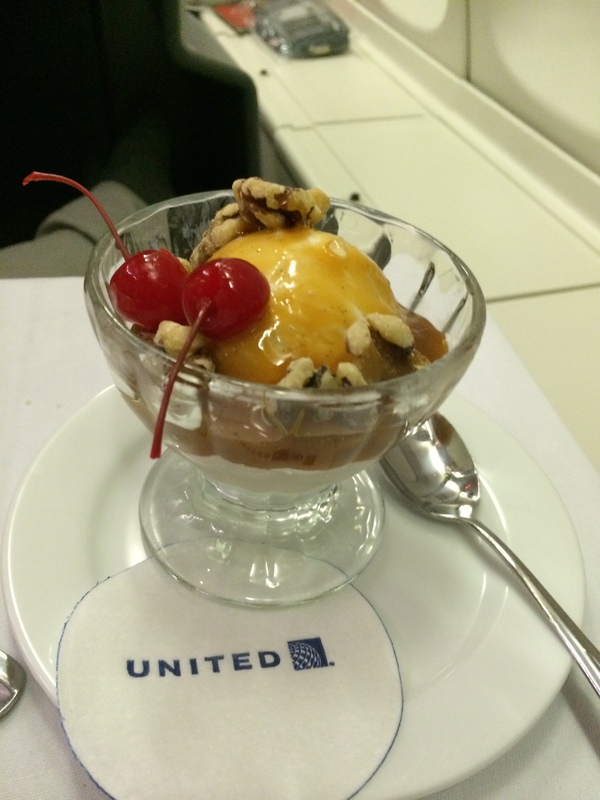 Dessert – Cheese plate and United’s new ice cream sundae cart! Very cool. 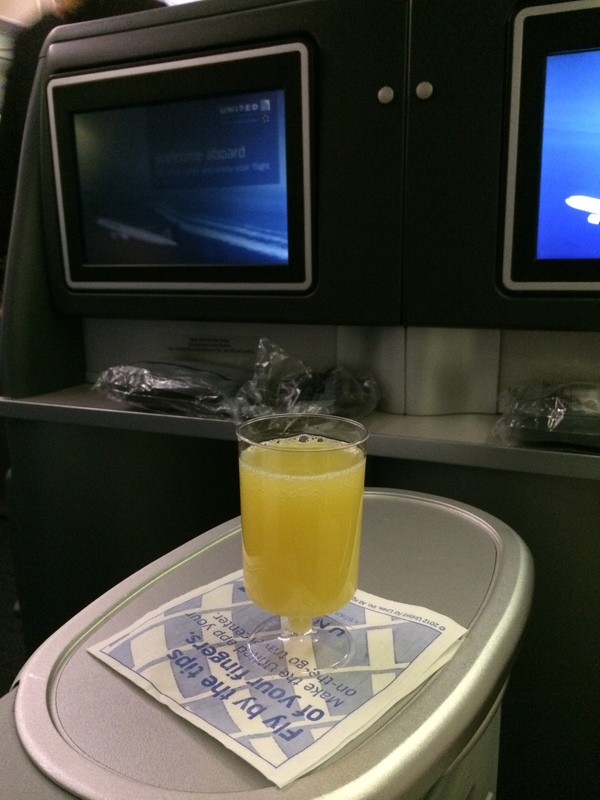 Beverage and Bar Service – Decent high end selection, but falling behind Asian and European carriers. This is what you minimally should expect for a ticket that cost $3-5K each way. 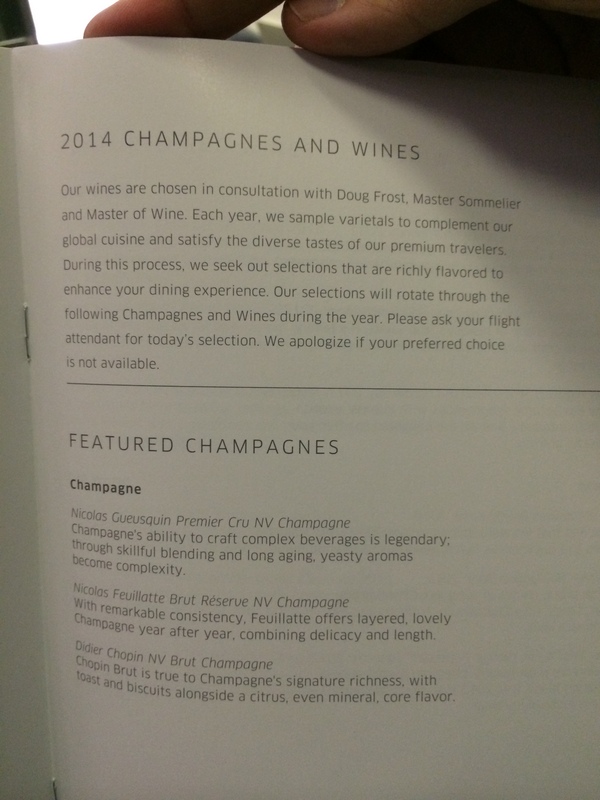 Champagnes and wines – I will give credit to United for offering legitimate champagne instead of sparking wine. Classy move. Since I do not usually drink wine on flights I forgot to photo the wine page, but it was middle of the road. Nothing really stood out, typical $20-40 bottles you can find at your local liquor store / bevmo. Before serving dinner the FA’s laid out the white table cloths and provided hot towels to wipe offyou hands and face. A nice touch. And now onto the actual photos of the food. Main Course: Despite the FA’s ever so United-esque warning I pressed my luck with only one selection. 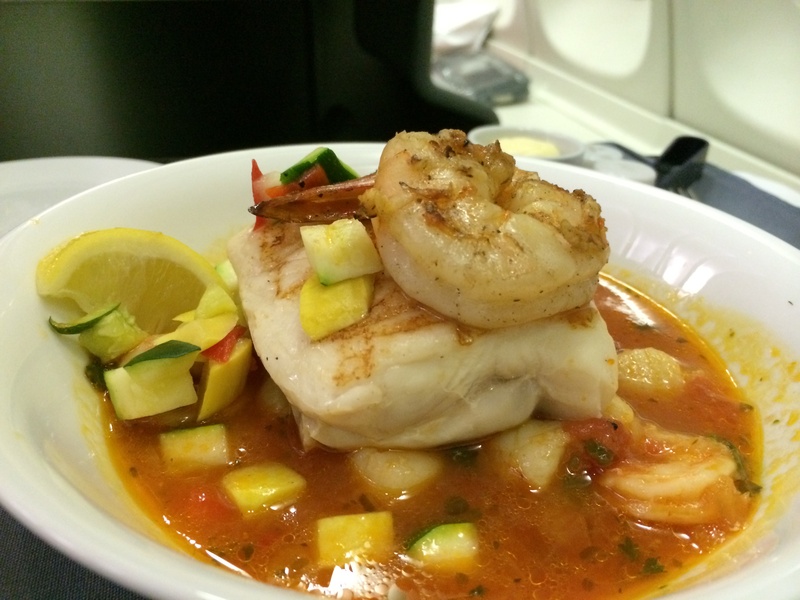 The San Francisco-Styled Cioppino arrived shortly after they cleared the first course. While it was visually appealing the broth was too thin/watery and the taste was very bland. Disappointing to see that after years and years United still cannot do a decent meal service. Everything needed salt/pepper to get any flavor at all. At least it was still mildly hot when it was served. Serving size was in a large bowl so it was at least a good filling portion. However I would rather have less portion with more flavor. 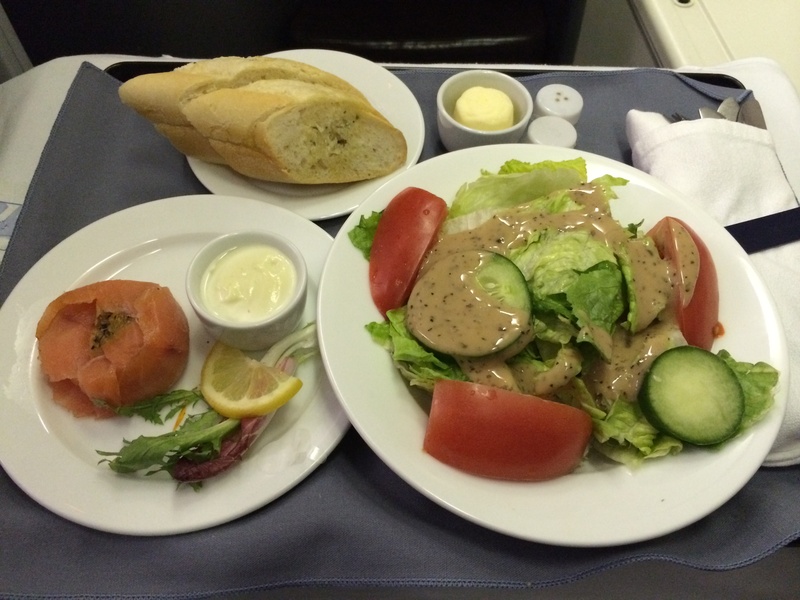 I understand that altitude often causes the bland taste as meals have to be prepared then heated while flying, but for business class this was disappoiting. Cheese Plate with Port. 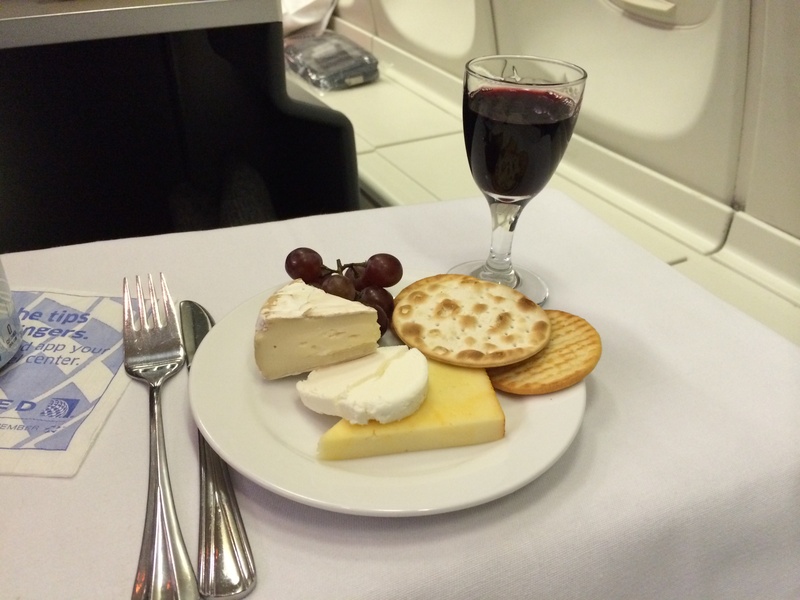 Cheese was good, grapes were clean and tasty and port was sweet and strong. Very good finish. You could get bread if you wanted as well, I passed on that. International Cheese Selection with Port. Dessert – Here is where things get really exciting. 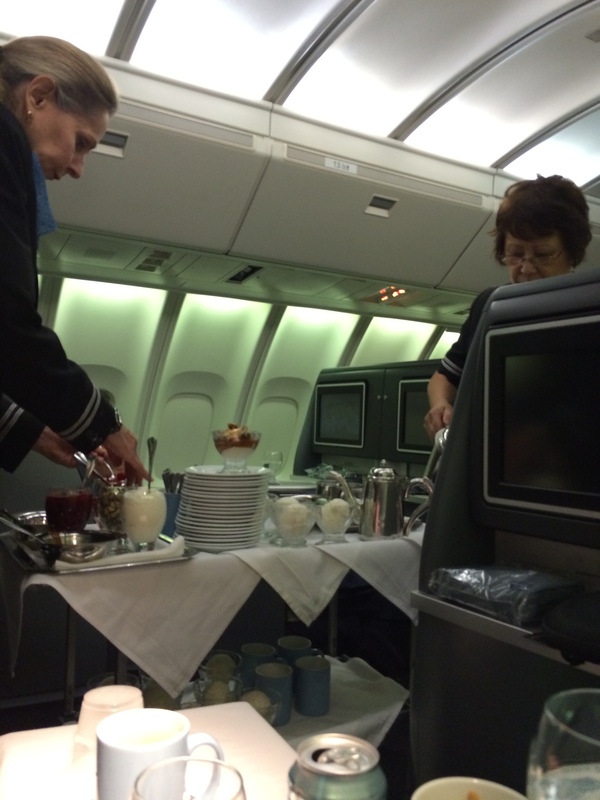 United provides ice cream bars for economy service on many international flights, but if you fly BusinessFirst there is a honest-to-goodness ice cream sundae cart! Vanilla ice cream (my favourite) with caramel, chocolate, nuts, cherries, and more! I selected nuts and caramel. Very classy that it comes in a real class container. Very fine end to a meal that started off a bit weak. The United BusinessFirst Ice Cream Sundae with vanilla ice cream, hot caramel, nuts and cherries. Yum! 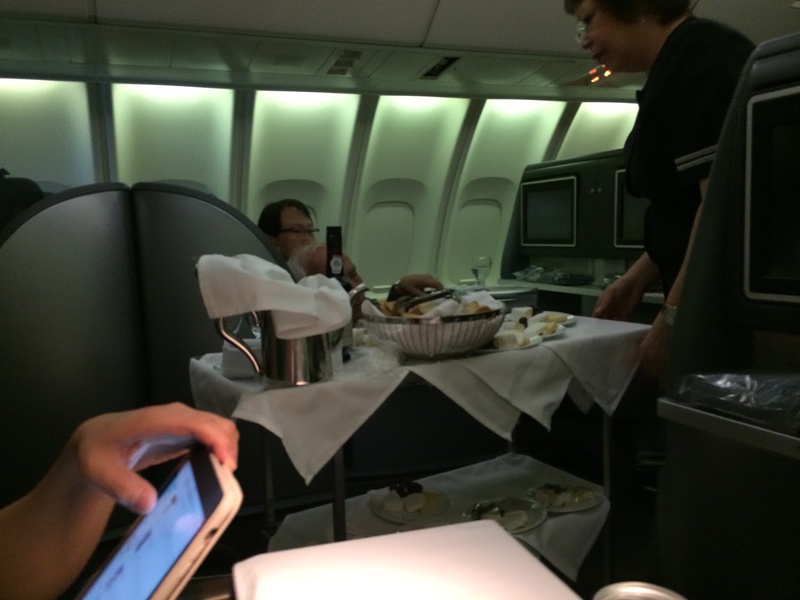 I always try and stay away for the meal service since its one of the best part of premium cabin service (that and lie flat seats for sleeping). After the dinner course I was able to get a few hours of sleep in the nice seats. When not sleeping I was addicted to watching all the new releases on the IFE system or playing candy crush on my iPhone. This flight also had Wi-Fi on board for a fee of $16.99, which was a good deal. However, it did not work when I tried to buy it multiple times over the course of the flight. Ignore the flight time below – that seemed messed up. 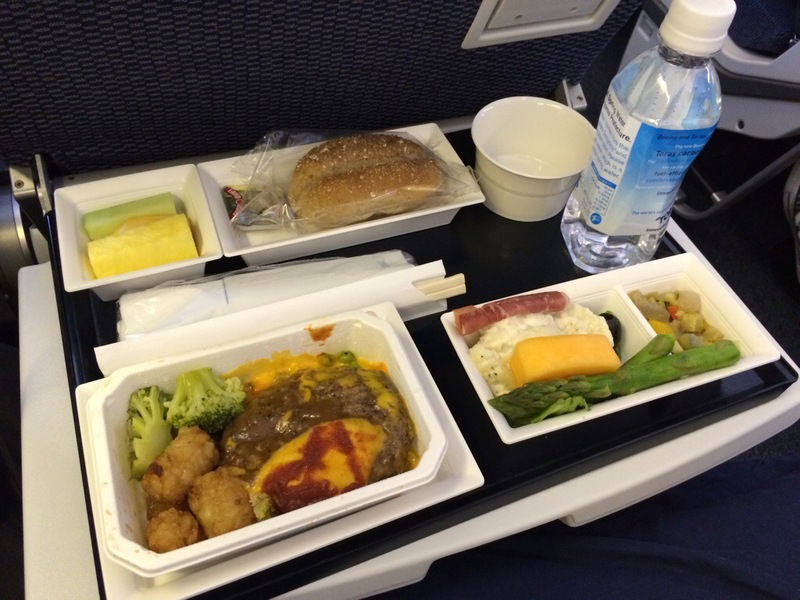 Here United provides choices of: Herbed Scrambled Eggs, Asian-Style Soup and Cereal and Banana. As I travel frequently I knew not to get the scrambled eggs as they are pretty much what you can get in economy and bland and tasteless. I selected the Asian-Style Soup, which had noodles, won tons, veggies and braised beef in savory broth. Breakfast also came with juice selection (I got apple), coffee/tea, bread selection and fruit. Overall a very good breakfast and I was getting very full before our landing. 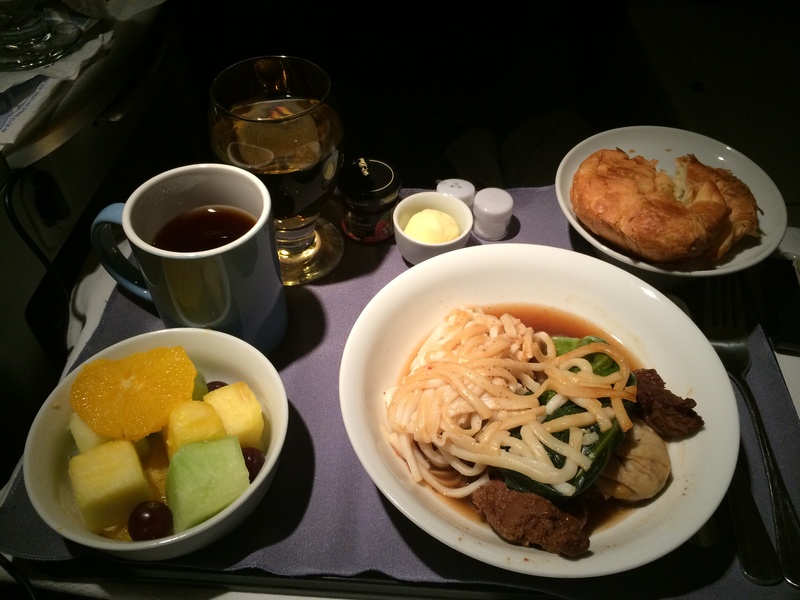 The FAs turned on the cabin lights after breakfast as we were getting closer to Korean. 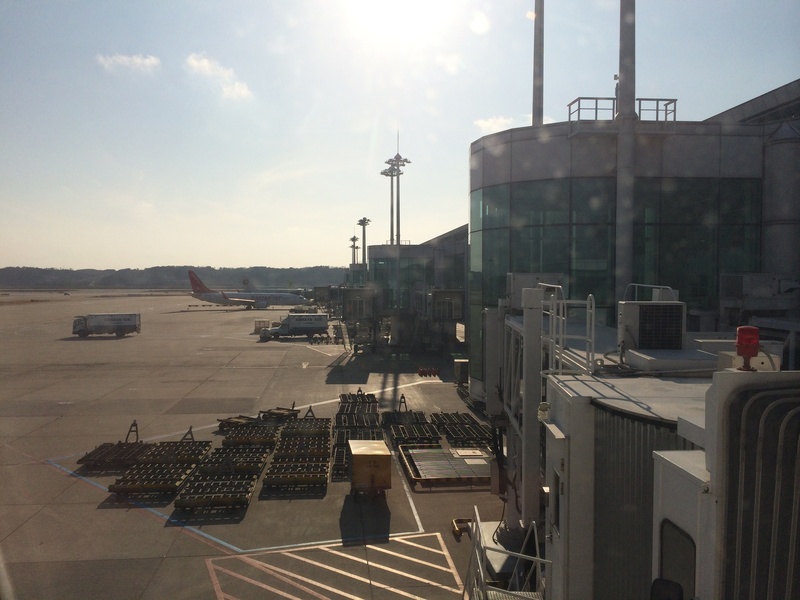 Touchdown: Incheon, Korea (ICN). Left SFO around 30 minutes late, but arrived on time. Wonders of international travel. We had a 2.5 hour layover so it was time to explore the terminal, get some food (again!) and prepare for our next flight to Bangkok on Asiana Airlines Business Class. 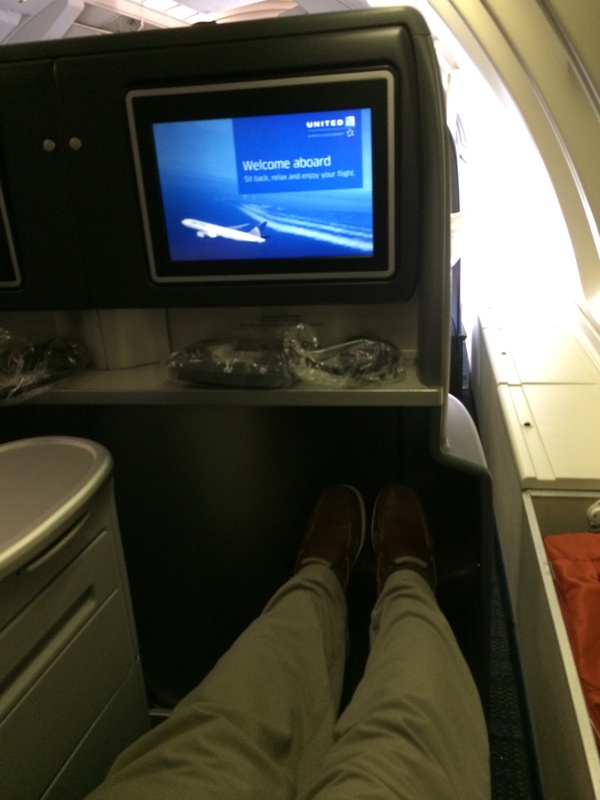 With United recent mile devaluation I was lucky to have booked a a business class trip right before the deadline. 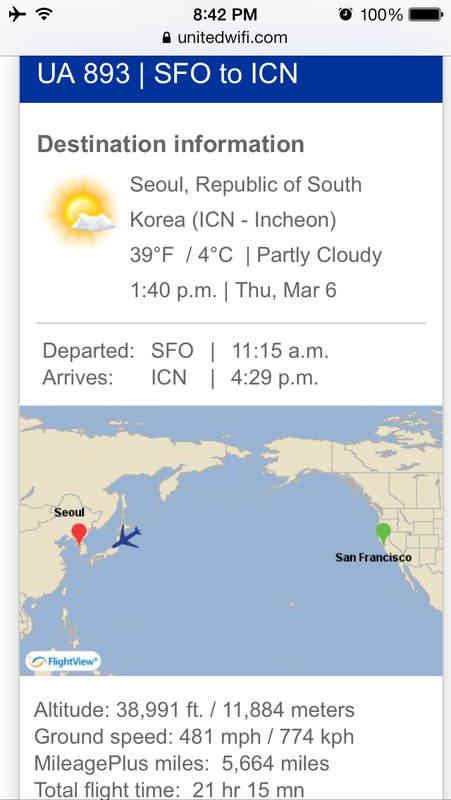 I ended up booking a trip from San Francisco (SFO) to Bangkok, Thailand (BKK) with a 3 hour stop over in Seoul, Korea (ICN). 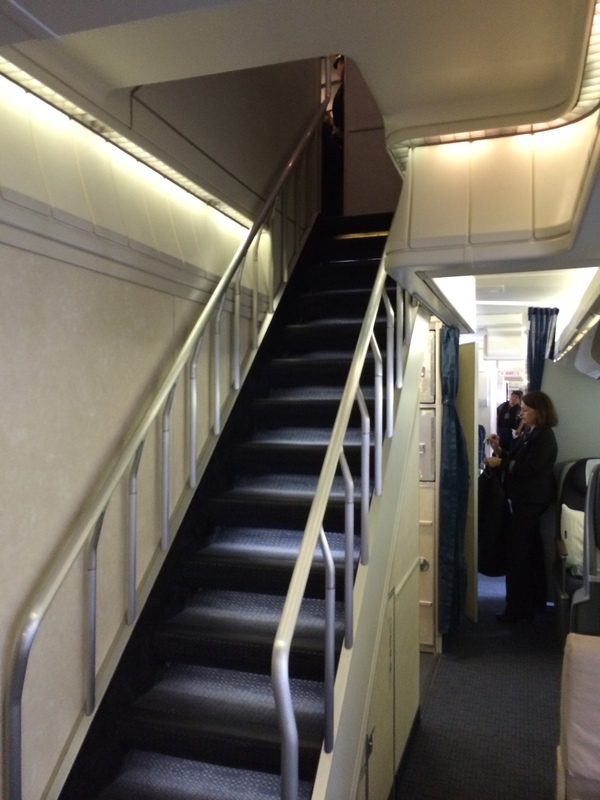 The first leg was on a United 747-400 and I got to sit in the upper deck (seat 13A), which is my favourite place to be since it feels more private than the business class seats on the bottom deck. 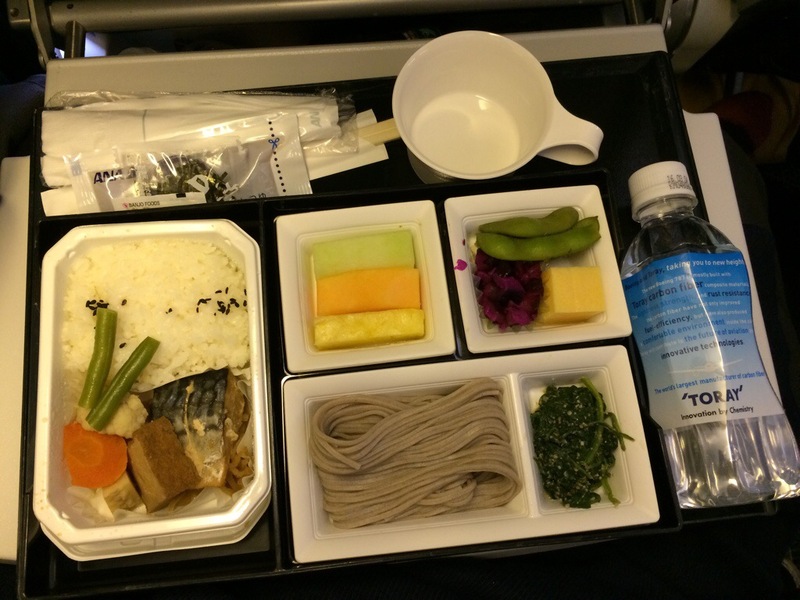 The flight from Seoul to Bangkok was on Asiana Airlines business class, which I will review later on. 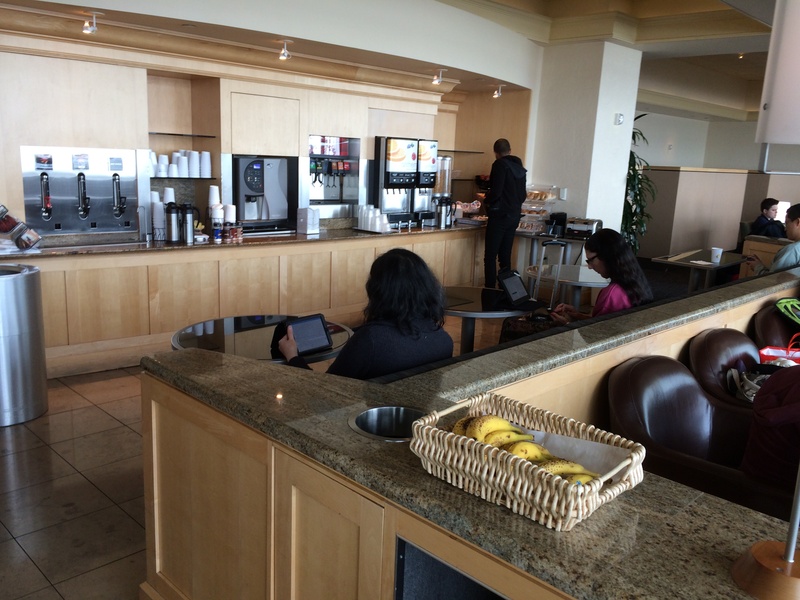 United boards from SFO’s fantastic international terminal, but their lounge is a total disaster. It is often crowded, bathrooms are dirty and the food and beverage selection very lacking (they make you pay for most of the good alcohol). Its only redeeming value is that its free with your business/first class ticket and its better than their domestic lounge (which is often worse than just sitting outside by your gate). 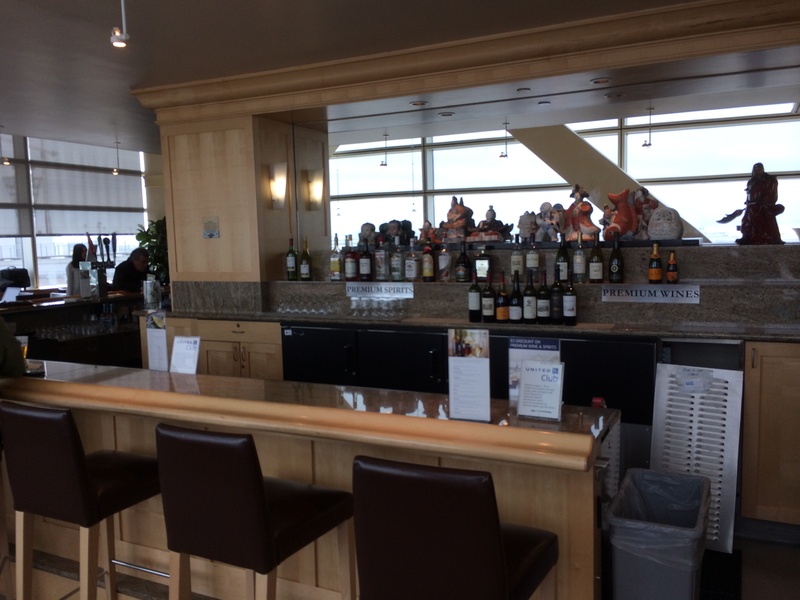 United Club Bar – premium alcohol (almost all the good stuff) was extra $$$. United Club Lounge area: bananas (literally) best described how bad it was. Free coffee, tea and drinks made from powdered ingredients. 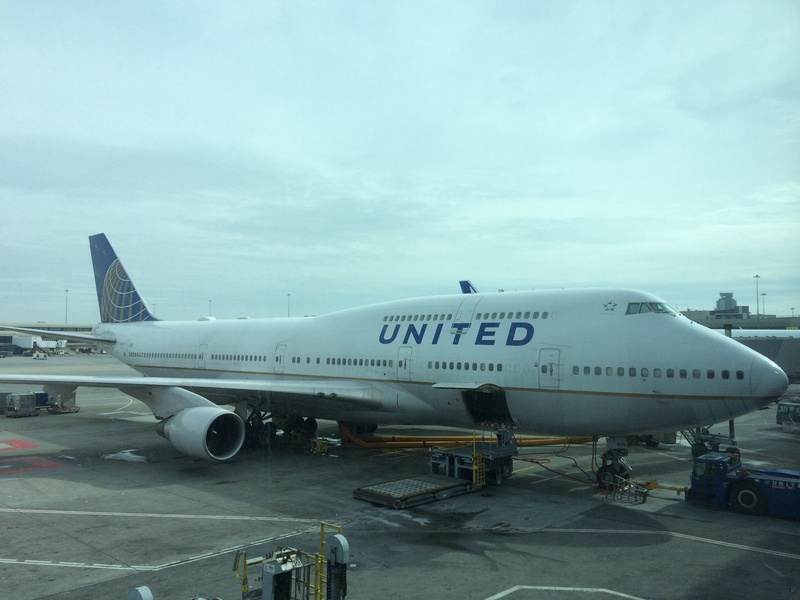 Boarding was uneventful with the usual United order of Global Services, First Class, 1K, Business Class, Gold, Silver, then by economy boarding groups. 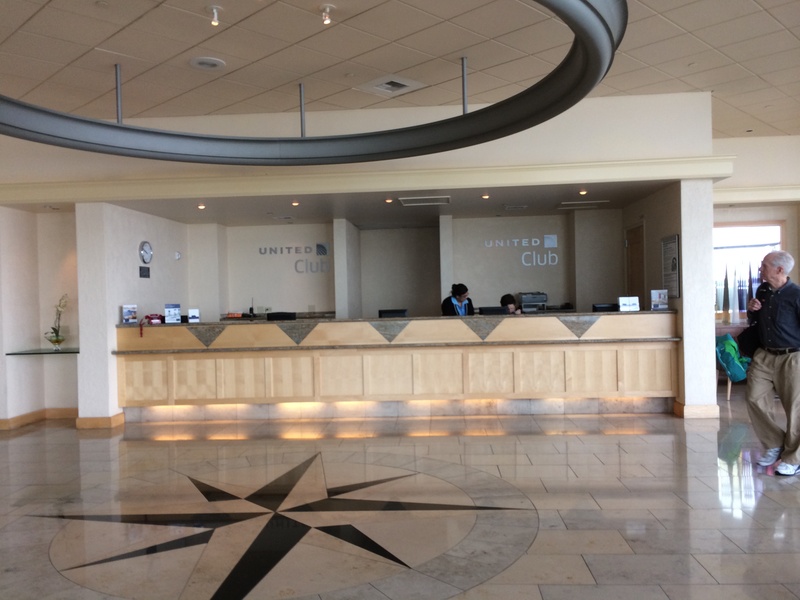 Since so many people have United co-branded credit cards there are lots of people in Group 2 (right behind Business/gold) and United Silver will get you into Group 2 as well. 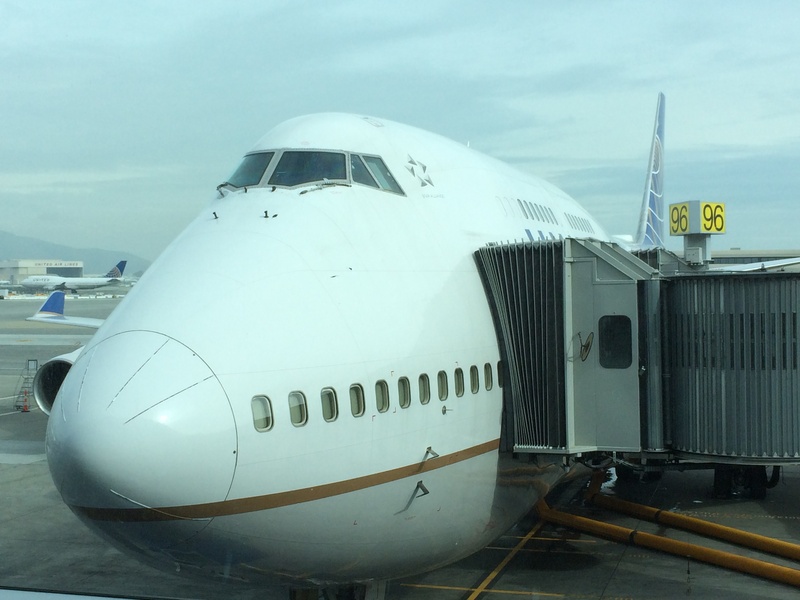 At SFO there are two doors since the 747-400 is a large plane and I used the business class one. These stairs lead to a magic place. 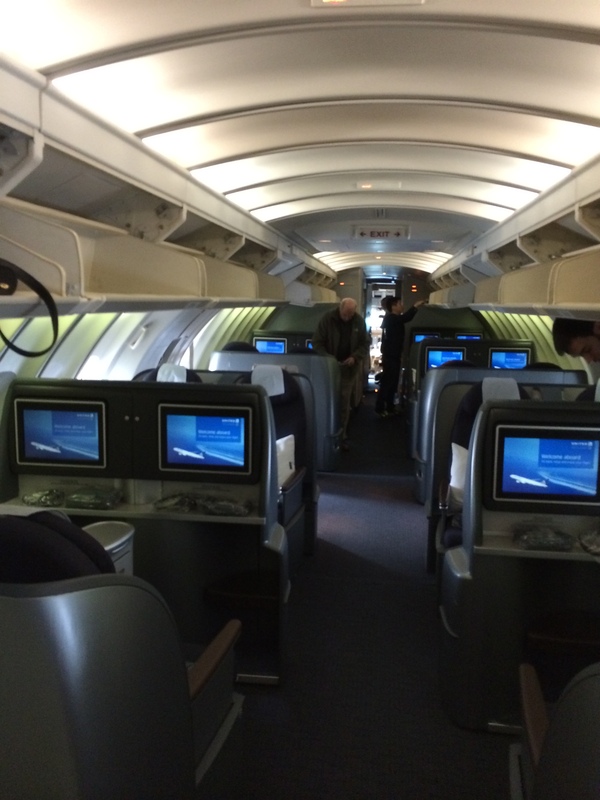 Business-First upper deck on the 747-400. Not a lot of above head bin room, but lots of room next to the seats. I had to put both of my carry-ons in the storage cubbies next to my seat, which was nice but made it hard to get the wheelie out. The seats themselves are the newer Business-First seats that have fully 180 degree lie-flat configuration. 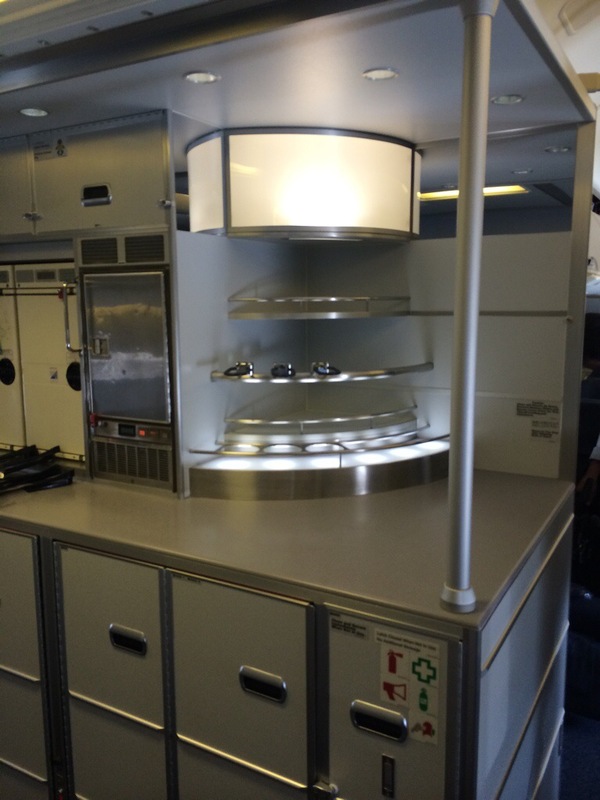 They fold down to allow 6’4″ of sleeping space with a 20″ across section (that is most narrow around the shoulders strangely where you think you would need the most room). 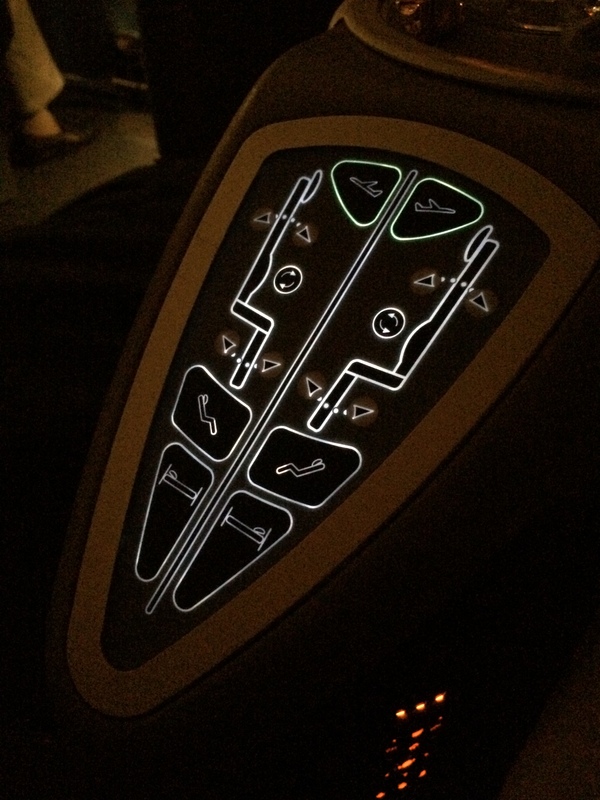 Seat seat has a 15″ IFE personal entertainment screen that had lots of the latest movies, in flight map, music and more. I usually end up watching lots of the movies to kill time but try to sleep on long flights. Lots of controls to play with if you like to adjust your seat. Had a air cushion for lumbar / massage, but it didn’t work very well. 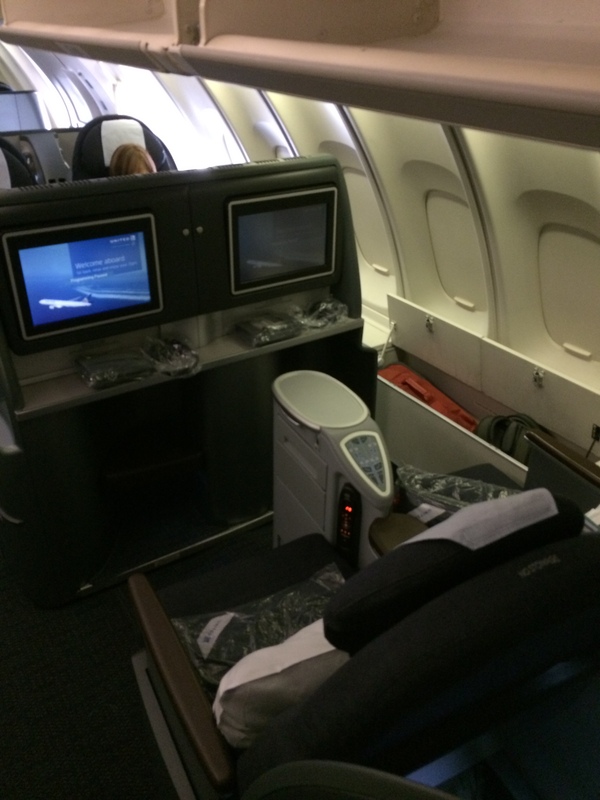 Overall the seats were 8/10 for business class seats, not as good as the newer pods on some european / asian carriers, but for a trip I booked for 120K miles I was not going to complain about being able to sleep on the 12+ hour flight. To be continued in Part 2: Food and Drinks.